Does the fact that Israel's military wins against all insurmountable odds prove that God protects Israel? 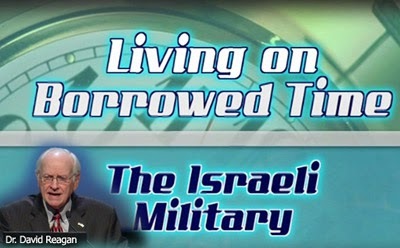 Overall, the Israeli War of Independence in 1948 resulted in an incredible, unbelievable, marvelous victory for Israel, and during the war there were many miraculous events. I want to tell you about one that you will find hard to believe. It occurred at a kibbutz called Yad Mordecai which is located 36 miles south of Tel Aviv near the northern border of the Gaza strip. The kibbutz is located on the coastal road from Egypt to Tel Aviv. The attacking Egyptian army consisting of 5,000 troops divided as it headed north. Half of the troops headed for Jerusalem and the other half of the troops went up the coastal highway toward Tel Aviv until they reached the kibbutz of Yad Mordecai. It's one of the most marvelous places I've ever visited in Israel. There are the actual remains of that battle that can be visited. The kibbutz had evacuated all of its children and most of its women as they prepared for the Egyptian attack. The kibbutz was left with only a handful of fighters, even some who were mere boys not more than 13 or 14 years old. The leader was an intellectual, and he was not a fighter. He was not a person who was a military person, so he didn't really know what he was doing. There were a few big fighters I wouldn't want to tangle with. The kibbutz was left with only 130 defenders against the massive Egyptian army. In total, there were 110 kibbutzniks and there were 20 fighters who came down to help from Tel Aviv. That's all they could get because everyone knew this particular kibbutz was going to be slaughtered. In preparation, the defenders dug trenches and reinforced them with sandbags. Their armament consisted of this: 37 rifles, one anti-tank gun, two light mortars, and two machine guns. That's all they had! Here's the frightening reality they faced as the Egyptian army with tanks approached. There was no hope for the kibbutz. Everyone knew that. They knew that this was a suicide mission, but they were willing to take a suicide stand. The Egyptians attacked furiously with ground troops, tank assaults, artillery barrages and air sorties. 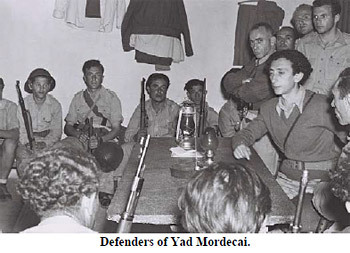 Incredibly, the Yad Mordecai defenders held out for five days! The Egyptians were not able to overrun the kibbutz until the defenders decided to retreat under the cover of darkness because more than one-half of them had been killed and the other half had been wounded. Over 300 Egyptian soldiers died in the battle and the five days gave the defenders of Tel Aviv the time to prepare their defenses. The kibbutz today has left the vehicles that the Egyptians could not take with them and they put up metal figures to illustrate the coming army. They've also put up primitive weapons in the remaining trenches used against the Egyptian army for reenactment. While the kibbutz held off the advancing Egyptian army, four Messerschmitt airplanes had arrived from Czechoslovakia. They'd been hastily assembled so that they could be used. They were deployed on May the 29th to help stop the Egyptian army before it could reach Tel Aviv. How in the world could 130 untrained civilians with only rudimentary armament hold off the Egyptian army for five days? No one to this day has ever been able to explain it. It had to be a miracle of God. In the fifth and last segment of our study on the end times sign of the the resurgence of the Israeli military, we'll marvel at the military brilliance of Operation Thunderbolt. I'll be leaving soon for vacation so I just wanted to wish Dr. Reagan, Nathan, L&L staff and everyone out there a blessed and Merry Christmas and happy and healthy new year. Merry Christmas billy!! Nathan et all!! May the Lord richly bless u in every area of ur lives in the coming year and may u prosper even as your soul prospers! ! Love susie! Hey billy....... let's Keep looking up! Won't be long before we r in the presence of the Lord greeting one another with a godly hug! ; wooooohoooo! That would be the Christmas present of a lifetime! And a very Merry Christmas to Billy, Susie and all our faithful readers. You all are a blessing! The 20 who arrived to assist the 110 defenders (20 of whom were females) of Yad Mordechai were not civilian volunteers. Those 20 (two 10-man squads) were the cream of the crop of the Haganah. They were members of an elite unit of what would soon become become Israel's vaunted Special Forces known as Plugot Mahatz, or Palmach for short. They were armed with combat rifles, a medium caliber machine gun and one British-made PIAT anti-tank bazooka. The Palmach had been created by Haganah seven years earlier to defend the Jews in the British Mandatory Palestine from the expected invasion by Nazi Wehrmacht, and their Arab allies, should Field Marshal Rommel's armies have British Forces under General Montgomery in North Africa. The Israeli Palmach were skilled warfighters accustomed to warfighting deep in enemy territory having fought with Australian troops against Vichy French forces in Tripoli, Lebanon and in Syria. At the start of the Battle of Yad Mordechai on 19 May 1948 the Egyptian Army had a 19:1 advantage in the number of troops engaged, plus one each armored and artillery battalions plus air support. These overwhelming odds clearly favored the Egyptian forces. However, after the Egyptian army threw its full weight into the initial assault they were repulsed having suffered a few dozen killed for the five Israelis who were killed in that contact. The Egyptians regrouped and attacked six more times over the next several hours. All of the attacks were repulsed. That night a full platoon of Palmach arrived with six British soldiers who joined them along with additional weapons and ammunition. Renewed fighting on 20 May saw the same results for the Egyptians, their combat effectiveness was almost nonexistent. No doubt the LORD God was assisting Israel in this battle. For the next two days Egypt merely fired artillery into Yad Mordechai which left not a single structure standing above ground; the Israeli defenders were fighting from underground tunnels and redoubts. Under cover of darkness on the night on 23 May a total of 124 exhausted Israeli survivors evacuated. At daybreak on 24 May the Egyptians spent four hours pounding the rubble of Yad Mordecai with artillery fire. Eventually they discovered the Yad Mordecai was left undefended and sent in troops to occupy nothing but rubble and smoking holes in the ground. The action at Yad Mordecai allowed the formation and consolidation of the Israeli Defense Forces that we know today. In total, sixteen Egyptian soldiers were killed for every Israeli soldier who died in the Battle of Yad Mordechai. Thank you for filling in the details, Sean - excellent info! I'm positive God is supernaturally protecting Israel. A few years ago, there was an article (I wish I could find it now) that stated Iran was planning an attack on Jerusalem. Then a volcano erupted, somewhere in Iceland or Greenland where the smoke was so bad that it thwarted the Iranian's plans. I believe the unprecedented snow storm in Israel and the surrounding areas were probably being done for the same reason. When Obama went to Jerusalem, God started sweeping him out of there even when he arrived. First, he took the "beast" with him. A man who was not familiar with which gasoline to fill it up with used the wrong gas so he wasn't able to use it; then a missile was fired at him and highly unusual winds and dust clouds grounded the presidential choppers, lead to cancellation of formal airport farewell ceremony he had planned for the Israeli youth and they had to drive to their next destination. It's God saying to him, I don't want you on My Covenant land and with my Elect.